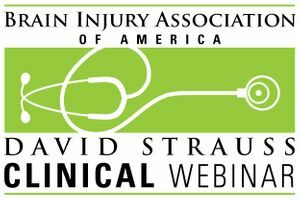 A David Strauss Memorial Clinical Lecture webinar featuring Sarah Fischer, M.S., CRC, CBIS, and Mark Cola, CBIS, Main Line Rehabilitation. Aired live August 23, 2018. Sarah Fischer, M.S., CRC, CBIS, and Mark Cola, CBIS, report on an evidence-based approach to providing Cognitive Rehabilitation Therapy services for the aging population. They describe the core components included in all treatment planning, from client safety in the home and communication/socialization skills through compensatory strategies, family supports, and quality of life factors. If you would like to purchase a CD, please select "CD/Handout Package, CBIS/T Rate (Includes 1 CEU)" from the drop-down menu. Please note that the CD will be available 4-6 weeks after the webinar air date.